Built to withstand the heaviest pallet loads, the Wulftec SMH-HVY takes on your most demanding stretch wrap challenges with efficiency and speed. Not only does this equipment cut down on stretch film use, it also improves the appearance and integrity of your shipping pallets. Semi-automatic stretch wrappers like the SMH-HVY increase safety and throughput with automated dispensing, wrapping and cutting. So, if you’re looking for a heavy-duty pallet wrap machine that will save you time and money, look no further. 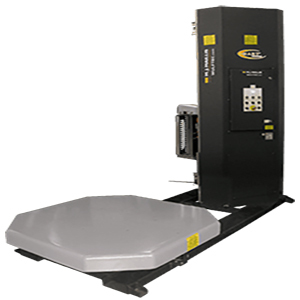 To learn more about the Wulftec SMH-HVY Semi-Automatic Turntable Stretch Wrapper, give us a call at (609) 337-3641 or request a quote online. As your strategic partner, we believe it is our responsibility to take care of your maintenance and repair services for the lifetime of your equipment. Whether you’re looking for installation assistance, maintenance or emergency support, our factory certified technicians are available 24/7 to discuss your needs.